Does a pup at Milton Landing indicate that there are fish nearby? On January 5th, this harbor seal pup looked over its shoulder towards photographer Rebecca L. Meyer, who was pointing a 300 mm lens at it. The pup was hauled out on the narrow wooden mooring at the Milton Yacht Club at the head of tidewater on the Neponset River. One eye looks a little bloodshot and its fur appears to be fluffed up all over except on its stomach, where it’s smooth and black-spotted. The pup was probably born last May or June here in Massachusetts or somewhere to the north and now weighs about 80 lbs. It will reach adulthood in a couple of years and could live to be 30 or 35. Though it may look like it has no front flippers, it does, at least according to this photo of an adult from Argyll, Scotland. Here you can also see the characteristic round head and V-shaped nostrils. The bones indicate that while a seal’s arms and legs are much shorter than ours, its hands and feet are larger. Hey, its big toe is twice as long as its thigh! Does a pup at Milton Landing indicate that there are fish nearby? 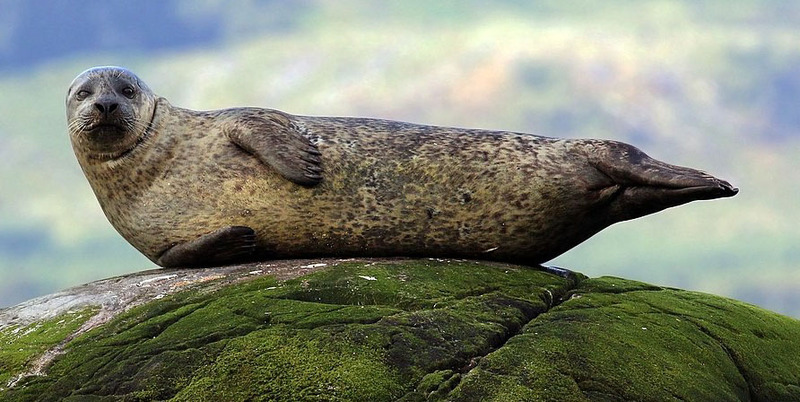 Could be, but harbor seals are also known to eat ducks and shellfish. Rebecca’s dad, Larry, a regular at the Landing, told me that he saw some large piles of clam shells by the canoe launch, as if someone had chowed down there. Maybe one day those clams will be legal to eat.